I love a good Valentine’s Day dessert – and I love cheesecake. But, if I am going to have cheesecake on Valentine’s Day, it better have chocolate in it! I found this recipe last year and have made it several times since then. The proportions are perfect. 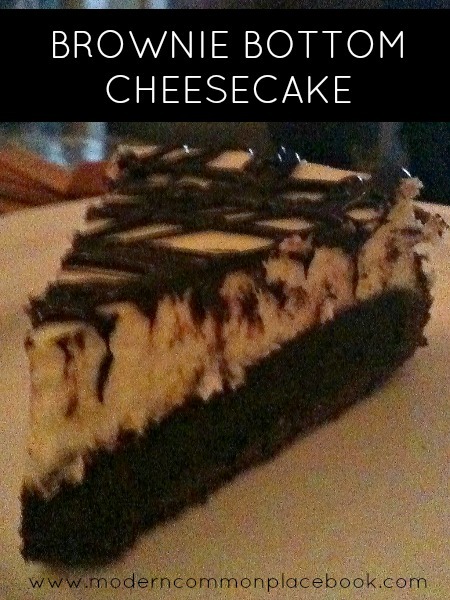 The chocolate, a perfect balance to the cheesecake. And, it is so simple to make! Preheat oven to 350. Lightly grease and flour a 9 inch springform pan or line with parchment paper. Set aside. Melt butter and chocolate in pan over low heat, stirring frequently, until smooth. Remove form heat and beat in sugar. Leave to cool 5 minutes stir constantly. Add eggs and milk to the chocolate mixture, beating on medium speed. Stir in the flour, mixing just until blended. Spoon into the prepared pan, spreading evenly. Bake for 25 minutes. Remove from oven while preparing the cheesecake layer. In a mixing bow beat together all the ingredient, making sure there are no cheese lumps then pour over brownie base. Run a knife around edge of cake to loosen from pan. Let cool before removing form pan. Chill in refrigerator for 4 hours or overnight before cutting into slices. Melt some chocolate chips with a bit of butter and drizzle on top!